What to do with all the asparagus? This is not a problem and, really, we could never have too much asparagus. Eggs and asparagus are always a tasty combination, and with 24 chickens, 14 ducks and plenty of eggs this is an easy meal option for us. 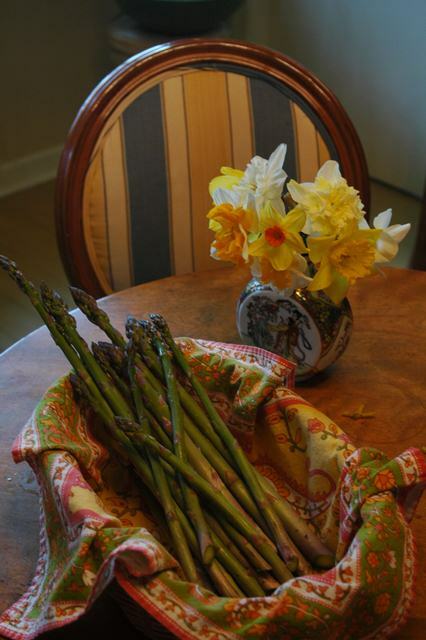 Asparagus omelettes are delicious, as are poached eggs on toast with steamed asparagus. Last weekend, I made several quiches (combining duck and chicken eggs) with asparagus and shallots (also from the garden) to serve to the participants of the dry stone wall building workshop as snacks and no one complained. Trim asparagus and cut diagonally into 1/2-inch thick slices. Mince the garlic and finely grate enough lemon zest to measure 2 teaspoons, and squeeze enough juice to measure 3 tablespoons. Prepare an ice bath in a large bowl in the sink. Fill a pot with water, boil the asparagus until tender-crisp, about 3 minutes, drain in a colander, and transfer asparagus to the ice water to stop cooking. Fill a 6-quart pasta pot three fourths full with salted water and bring to a boil for the pasta. Cook the pasta till al dente, timing it so that the pasta is cooked when the sauce, below, is ready. In a deep 12 inch, heavy skillet cook minced garlic with salt and pepper over medium low heat till fragrant. Stir in the cream and lemon zest and simmer, stirring occasionally, until slightly thickened, about 10 minutes. Add the shrimp and cook till they turn slightly pink, about 3 minutes. Add two tablespoons of lemon juice and remove from the heat. Drain the cooked pasta, return it to its pot, add the shrimp and sauce, add the aspargus, toss to distribute the sauce evenly and add additional salt and pepper to taste. Yes, isn’t that surprising? Apparently if you try to snap the asparagus, to remove the tough part, it will snap at the right place. I’ve yet to try this. Thank you for that. It’s in season here too and there are buckets of ‘wild’ asparagus – the long stringy one – being sold by the roadside. I brought some home full of glee thinking that its length and thinness meant it would be tender and tasty all the way up but actually its tough as all nails except for the little delicate shoot at the top.